On June 1st, a billionaire got married in Big Sur. He spent $10 million dollars for the wedding, and will have to pay the Coastal Commission an additional $2.5 million dollars as a fine - at least, that is the proposal. The Coastal Commission is going to consider the matter at its meeting this coming Friday, June 14th. 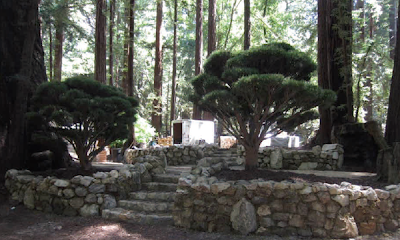 Compliance with a negotiated "Cease and Deist" order, and a negotiated "Restoration" order, is Sean Parker's penalty for having made massive changes to the natural environment, and for having built a "fantasy world" among the redwoods, without the benefit of a required coastal permit. The billionaire's action was called "fucktarded" by one of my Facebook Friends. The Urban Dictionary says that "fucktarded" means "a situation, person, or thing that is both fucked up and retarded simultaneously." That description may be apt. My own observation is perhaps less vituperative. Pictured below is the "fantasy world" that the billionaire created in the redwoods. Above is the "before" view. Now, as between the World of Nature (above) and one of our human creations (below), which seems best to exemplify the kind of world in which we should want to live? You decide! If you like the "above" picture better, and don't think the "improvements" made for the wedding actually made any genuine improvement to the World of Nature at all, think about whether there isn't a more general lesson to be learned from Sean Parker's "fucktarded" wedding. For all I know, it actually was an improvement. What's galling, though, is the idea that if you have enough money, you can just do whatever you want and then buy your way out of the consequences. I'm sure it was always so, but the scale of what it's now possible to do makes it seem all that much more audacious. And the supposedly benign face of huge corporations like Facebook and Napster make it seem more insidious. I will be amazed if the Coastal Commission gets $2.5M I'll bet Parker's attorney will talk it down. I hope the Commission prevails on all violations committed by this twerp.